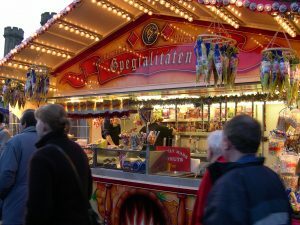 Lincoln brought the first traditional German Christmas market to the UK as part of its friendship and twinning with the town of Neustadt in Germany. The market grows annually, constantly adding new attractions to excite the senses of visitors from near and far. From its beginnings in 1982 with just 11 stalls in Castle Square, the market now takes over most of the cultural quarter of the city, with well over 200 stalls. The German link is still strong, with stallholders from Neustadt bringing German crafts, food and drink to the market – a perfect gift if you want something a bit different. For some, the Christmas Market is the most important event in the city’s calendar as it brings over 250,000 visitors to Lincoln. These visitors often return at other times in the year when they realise what Lincoln has to offer. One thing is for sure, those on the hunt for beautiful, hand-crafted and unique Christmas presents will find a treasure trove of goodies from a spectacular selection. Visitors to the market should look out for hand made jewellery, hand poured candles, wooden toys, hand painted glass, ceramics, photographs and locally created art, as well as fabulous fresh produce from the local area.